Recently we elected another new director at the Cold War Air Museum. 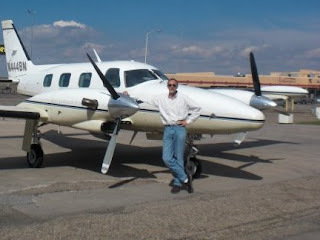 Andre is a local businessman who frequently flys his Piper Cheyenne on extended business trips. Andre is also a long time partner in one of the L29's on the field and actively participates in various airport activities. 68SJ was featured in one of our earlier posts. We appreciate Andre's support and look forward to his participation at the museum. Andre -- I met you on a flight in December from SLC or Denver. I am in the software business in oil and gas. We sat together with another gentleman in our row who was also quite tall, in the exit row. I have an idea on how you can get introduced to several people in the industry at no cost, and at a fairly high level, if you are interested. An event is coming up in 2 weeks I want to tell you about. Please call or provide your email address at your earliest convenience. TY. Brent Dahle 405-315-5391 OKC.